Adams Heating and Cooling company provides new furnace installation, furnace repair, and furnace maintenance throughout the greater Kalamazoo area. Adams has been the trusted source for over 25 years, with service and quality second to none. They have the answers to your furnace questions! What is important to know about furnaces? Everyone knows that a furnace heats your home; however, whether it uses gas or oil, what else should you know? Well, first of all, you should know when it might be time to consider a new furnace. Typically, when your furnace is 20 years old or more, you might want to consider a new one. The reason for replacing the old furnace is an improvement in efficiency and safety. This can lead to significant cost savings for you. Why is a furnace more advantageous than other forms of heating your home? One big advantage is that you can easily use a furnace in conjunction with an air conditioner because ducts can be used for both. A boiler, for instance, doesn’t use ducts, so the air conditioner would need ducts put in place, making it far more expensive on its own. Another advantage is that a humidifier can be installed on a furnace to add to the comfort level of your home. And finally, an air purification system can work with your furnace to help improve the quality of your home environment. When should maintenance be performed on a furnace? The best thing that you can do to maintain a furnace is schedule a Fall Tune Up. If you use Adams, their tune ups include things like general cleaning, adjusting/inspecting safety controls, and checking carbon monoxide levels. How do you know what furnace to buy? Adam’s experts can help you make this decision, and complete the furnace installation for you. They sell several models of furnaces, and understand what furnace is best for each situation. 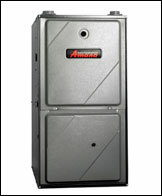 For gas furnaces, Adams uses Amana, one of the best brands in the industry. These gas furnaces can be very energy efficient, and certain models even qualify for rebates. Adams Heating and Cooling also sells oil furnaces made by Bard, another premier brand in the industry. Fuel oil typically makes the cost of these furnaces a little higher, and less energy efficient. If you have a furnace, and need to purchase filters, Adams can also provide that for you, and make recommendations about each type of filter. For instance, they recommend long lasting filters for new furnace. Call Adams Heating and Cooling for all your Kalamazoo furnace needs.